On October 3rd many of you received an email from Bob Goldfried regarding his opinion on the upcoming recall ballot. I would like to take this time to address Mr. Goldfried’s objections. First, let me state that there is a reason that a recall election process is in place. Just as the election process allows the residents of this community to have a voice in how the community is managed, it also allows that voice to be heard if they feel it is being mismanaged. In addition, the recall election process SHOULD also prevent the Board from arbitrarily removing another Board Member. However, as many of you know, the current Board unjustly and illegally removed me from my position without a vote of the owners that elected me. Regardless of what happened to me, the required number of members of this community have legally filed petitions to recall three of the current Board Members and therefore, the Community has the right to vote on those petitions. My goal is to promote a fair system that will ensure that owners’ votes count, and that Sun City Anthem has a board that acts lawfully to ensure fair equitable treatment of all owners. The following (in italics) is the letter sent out by Mr. Goldfried. I will in turn address each of his comments with my own opinion on the subject below each excerpt, and leave you to make your own decision. Why should owners not use the legal removal election process if more than 10% of the owners legally call for it? The law governing how volunteers are annually elected to HOA boards also specifically defines the only lawful way elected directors can be removed – by an owner vote. For the reasons mentioned, the removal of a director is higher bar than getting elected in the first place. (b) At least a majority of all votes cast in that removal election. NRS 116.31036 (2) A removal election may be called by units’ owners constituting at least 10 percent, or any lower percentage specified in the bylaws, of the total number of voting members of the association. Therefore, it is legally required to conduct a removal election if more than 10% of the owners call for one—whatever their reasons. Their right to do that is protected and should be respected even if their chance of success (even without active campaigning against it) is small. It is not surprising that you have the misconception that you do since there is active, full-on corruption of the official record to conceal what’s really going on in this community. This involves all the directors against whom petitions were signed. For example, the Board President and Secretary blocked a clear statement of my complaints from being placed on the agenda (as required by NRS 116.31087) and therefore dismissed my legal right as a unit owner. The Board Attorney also allowed six members of the Board to meet without me, the seventh (and supposedly equal), Director. This is a very well-reasoned argument and fully supports my claim that my removal from the Board on August 24 without notice or due process, and certainly not by 35% of the owners voting me off in a legally-mandated removal election was neither legal nor fair. Having a removal election does not make the annual elections a charade at all. However, how I was removed certainly does. Six members of the Board secretly voted to remove me from the Board seat that 2,001 owners had elected me to fill just 116 days earlier. Doesn’t that look like they just thumbed their noses at the 2,001 owners who voted for me? You are right. They should not have kicked a Director off the Board without any evidence of wrongdoing, but they did. The allegations that I was making a profit from my board position were patently false and beyond ludicrous, but more to the point of your argument, they should have produced some evidence, filed a complaint against me, and gotten a ruling from proper authority. But, they didn’t. They secretly decided based on no evidence that I was guilty and that they had the “fiduciary duty” to declare my board seat vacant immediately upon my being handed the notice of their action. I think this flagrant disregard for treating a duly elected member of the Board with common decency is another reason owners should vote these Directors out. They are simply not being fair and taking care of the interests of owners. They are willing to go to extreme lengths to prevent a dissident voice from being heard—even breaking the law. This simply should not be tolerated until the next election. If you want specific examples, I’ll post my notices of intent to complain (which were used in a gross convoluted gerrymander as the basis for saying I was putting matters before the board to make a profit), and I’ll post other documentation of improper conduct on my new website www.scastrong.com. I started the website in an attempt to restore my reputation from damages caused by the atrocious lies that have been said about me in the process of kicking me off the board. Again, this is a cogent argument for reversing my unlawful removal, but it is not a good argument against having a removal election called for by over 10% of owners. Although the law does not require that directors only be removed for cause, it does require that 10% of the owners call for a removal election. Then, it requires that 35% of owners vote in favor of removing the named Directors AND that the majority of those who actually vote must be in favor of removing them. The law provides for an alternative to the annual elections, but is designed to make it very difficult. Doesn’t it seem incongruous that the same Board members who are protected by these very stringent legal requirements from being removed from the Board for frivolous reasons thought it was within their authority to issue an edict that remove one of the Directors without regard of this law by six of them simply voting in secret to declare it? I think the petitioners called for the removal election for reasons much more substantial than just disagreeing with a few Board decisions. I think the reason so many people want a removal election of Rex, Aletta, Tom and Bob is because they are not doing a good job at ensuring that all of the people here are treated equally and fairly, and they are very dismissive of community complaints without taking appropriate action. None of these four Directors even acknowledged that that there might be a slight possibility that they personally needed to show some leadership to correct the management problems and policy deficiencies identified by the petitioners. To just blow the petitioners off as whiners and complainers and do nothing about the issues they raised is not treating owners fairly. Then, to berate them for NOT wanting to wait until the next election to get new Board members (that will be more responsive to the owners’ needs) just exacerbates the problem. Over 800 owners signed petitions to remove four directors who, in the view of at least those 800 people, have a very strong bias against listening to people and against meaningful owner involvement in governance. But the biggest issue which has been glossed over is that many people want these directors out because they have a big blind spot when it comes to the General Manager, Sandy Seddon. Nobody is complaining about how well she handled the deferred maintenance, but many, many people are dissatisfied with the way they are being treated and the Association is being managed. At the last Board meeting while the budget was being discussed, the board spent most of their discussion congratulating themselves and absolutely gushing over how pleased they were that Sandy answered all their questions—unlike the former management company that kept proprietary secrets. I would love her too, and so would all the petition signers, if she treated all of us homeowners like she treats the board members she likes. In this case, there is cause to justify removal of these directors without waiting for the next regular election. The causes cited in those petitions are really big problems to the 800+ people who signed them and those people’s concerns have been ignored, marginalized or insulted by the Directors they want removed. On the other hand, I worry a great deal about the problems that are perpetuated because this Board has a strong culture against utilizing the expertise of owners and for attacking people who try to bring forward suggestions for improvements or better management or governance practices. These are the things that I think chill the willingness of qualified residents to serve. The way I was treated as a Board member was horrible, but it was covered up and glossed over so you and the community don’t know a fraction of what happened behind the scenes. Even still, there are people who have told me that they would never go on the Board because it is so dysfunctional and abusive to anyone who tries to stick up for the little guy. Don’t you think if hundreds of people started collecting signatures to remove you, that you would try to find out what their problems were and work with them to try to solve them? That’s not what these directors did. They did not treat the petitioners as having any value. They did not treat the problems the petitioners defined as even being worth their notice or any response. They attacked the messengers and called them “CAVE people,” never once responding to a single issue raised on its merits. The Board never answered, but they had a full defense mounted by blogger David Berman whose campaign against the removal election has been to discredit the people who raised the concerns and to reject the need for the Directors facing recall to take any personal responsibility for corrective action. They violated By-Laws 6.4(c) to prevent my access to ANY association records because they did not want me to make inquiries into the GM’s compensation. They also refused to treat me like an equal director during my entire term of office primarily because I expressed strong opposition to the practices mentioned above and unlawfully excluded me from board meetings wherein they took action against me and the Foundation Assisting Seniors. The ruse used to “deem my position vacant” was that I had put matters before the Board for personal gain. I will post a list of the matters I put before the Board on my website, and you will see for yourself that there is no way their pretext for removing me has any merit whatsoever. Forgive me if I am not sympathetic to how unfairly they think they are being treated by people who are calling for a legal removal election. The real question is—do you want to live in a community where the Board takes the law into their own hands and disregards the legitimate vote of the homeowners as this Board did when they removed me? This letter and the on-line postings against the recall election is part of a huge effort to defend a Board that does not hold itself accountable for obeying the law? I ask you—why aren’t those that oppose the recall on principle, making an equally strong objection to the arbitrary removal of a duly-elected Director without any petition or removal election or owner vote whatsoever? Mr. Goldfried has every right to send out his letter in opposition to the election recall. However, the Board and management’s interference in the process is another matter. I have submitted several complaints regarding interference with the removal election process which are currently being investigated by Christina Pitch of the NRED HOA Investigations Unit. The most recent issue has been the General Manager’s refusal to post in the online Board Book the Update on the Removal Election because (according to her) it was only supposed to be an oral report. Don’t you think that the actions six directors as outlined above and the secret voting to remove a director they don’t like, is a much more dangerous precedent? That last paragraph is riddled with hyperbole. We currently have a blatantly egregious Board of Directors that has stirred up 800+ community residents to the point that recall petitions were circulated against four of the seven members. You might call this, “The Perfect Storm” and something that has never before happened in this community. I would hope not to see the need for another recall election in the near future and certainly not four members at once. To move people to “chaos” takes more than the simple fact of not having their favorite candidate win an election. And with a seven-member board, one bad actor on the Board would not likely cause an uproar because that person would likely be out voted by the good members of the board on most issues.. The fact that there is a recall method specified in NRS 116 and the By-Laws and that the owners do take an active role in maintaining the community is a very positive selling point for future residents. Please look at both sides of this issue and be sure to look at www.SCAstrong.com where I will post the actual documents and evidence to support what I have outlined above and more. To get updates in your inbox, subscribe to our newsletter. The following was originally written and distributed by Ron Johnson and is republished here with his permission for you to see what others are saying about the current HOA Board and happenings. In a letter to residents, OSCAR’s leadership team of former board members and others have attempted to support their opposition to the Board Directors removal petition by making a number of claims about SCA’s self-management, financial condition and other issues. Unfortunately for the intended readers, the OSCAR letter makes a number of gratuitous and false claims, which I have commented on below. Our facilities are in better condition than they ever were with the management company. False. It’s blatantly misleading to attribute the poor condition of Liberty (and now Anthem) Centers to FSR when successive Boards deliberately ignored and refused to timely address needed repairs. We no longer have to pay $36,000 per month to a management company. True. However, SCA is compensating key management staff a similar amount per month. Current payroll expenses are less than we formerly paid the management company to manage our Association. Inconclusive. There’s an array of issues that affect payroll expenses, including startup vs. FSR wage scales and employee turnover, which happens to plague custodial jobs here. Sun City Anthem is in excellent financial condition. Expenses are under control. False. With management deferring over half a million dollars in originally scheduled repairs for 2017 to 2018, that’s a picture of expenses out of control, not of expenses under control. Revenues exceed expenses by nearly $450,000 through August. False. Indeed, management simply manipulated the books to reflect that revenues exceeded expenses. How did they do that? They did so by moving $550,000 in reserve expenses that was originally scheduled for 2017 to 2018. In doing so, SCA’s revenues for 2017 could only then reflect an excess over expenses. Some might refer to that as hocus-pocus accounting. No dues increase is expected for 2018. True, but. Only on the basis of questionable financial statements does the “no dues” decision make any sense. In reality, though, the Board is keenly aware of the extent of SCA’s financial problems. It’s evident that SCA did not have the funds needed to do all of the work that had been scheduled for 2017. And faced with the recall effort and despite incurring excessive costs for unbudgeted work at AC, the Board was unwilling to confront the downside of requesting members to authorize a supplemental assessment, let alone an increase in our annual dues. Further, the Board was privy to a legal opinion that will require homeowners to significantly increase their contribution to SCA’s reserve fund, further aggravating SCA’s financial picture going forward. The 2017 dues increase was to replenish the Reserve Fund after costly repairs to Liberty Center. Assuming that to be true, that increase should have been returned to the homeowners in the 2018 budget. That return is not scheduled to happen, especially given SCA’s current funding problem. The number of NRS complaints filed is an invalid metric. There are ZERO open complaints in the Ombudsman’s office. False. I am aware of roughly a dozen mostly recent complaints that have been submitted to the Ombudsman’s office, which includes a recent case that I had filed and was assigned to an investigator of their Enforcement Section. Financial hanky-panky or something else? Contrary to what others may have led you to believe, the 2018 Budget portrayed a not so rosy picture for our association’s condition. While SCA’s financial condition has the appearance of being good, even “excellent” according to those OSCAR advocates, appearances can be deceiving. There is no doubt that homeowners will be reassured in learning that our assessments will not increase in 2018, but in view of what’s going on behind the scene, such reassurances appear to be merely hype and misplaced. Funding repairs for damage to “hidden assets.” “Hidden assets” are typically underground or in the walls and in addition to the equipment needing repair may involve water damage, mold remediation and related construction work. When such damage occurs, it can be very costly, as at Liberty Center and the Locker Room project at Anthem Center, which together may exceed one million dollars. Traditionally, hidden or invisible assets are not included in reserve studies, perhaps because they are not visible or due to the mistaken belief that such assets have a life expectancy of more than 30 years and, therefore, are not required to be reserved. As a result, there are no reserve funds set aside when such assets fail, thereby creating a funding problem. That funding problem can be resolved in one of three ways: 1) a one-time only special assessment to fund the needed repair; 2) an increase in annual assessments, which was done in SCA for 2017 and subsequent years; or 3) utilizing existing reserve funds, which has the practical effect of robbing funds intended for Peter to pay for the work that Paul needs. Note that the second option is effectively permanent unless the funds are subsequently returned to the homeowners after the initial need was satisfied. And note that the third option might create a shortfall in needed reserves. Rob Peter to pay Paul? SCA’s management team has been very busy last year and this year in moving large sums of reserve funding around for reasons that I do not understand. I happen to get a little curious when association reserve projects do not get done as planned. How can that happen? Yes, a repair project here that there might be deferred a year for one reason or another. Let’s take a look at the 2014 Reserve Study. That study, as all HOA studies do, sets forth a yearly plan of which equipment or projects will be repaired or replaced, presumably in advance of their estimated life expectancy. For example, the 2014 RS called for an estimated $225,000 in fence painting for 17 Villages in 2017. That didn’t happen, although some disappointed homeowners may have expected to have their fences painted in 2017. Such is life. What did happen was that in 2016 in connection with the “mathematical” 2016 update performed by Criterium, management decided to eliminate that requirement for 2017 and changed the RS schedule for fence painting to read “2018” for each of those 17 Villages. Why did they do that? I do not know. I suspect that they might have done that because that money was needed for a different project for which there was no funding authority in the budget. Were similar deferrals made in 2016? I don’t know but I do know that the reported total dollar value of all changes made in reserve spending for 2017 and deferred to 2018 (based on the 2014 RS) was at least $550,000. Now, this year our management team has been busy making similar changes to the 2018 RS plan, reportedly deferring in reserve spending in 2018 “as much as $800,000.” What’s going on? Management has claimed and would have us believe that they are merely saving the homeowners money that did not have to be spent on the projects that they decided to defer to the next year. If management is going to make such changes to the estimated life expectancy of association assets, I would hope that they are adequately documenting the basis for those changes since they are deviating from nationally recognized standards that are employed by all HOAs. Reserve for invisible assets. A decision to reserve for invisible assets would likely have a significant impact on future assessments. Association’s liability for walls and fences. Rumor has it that a legal opinion has been received advising that the association is legally responsible for 100% of the walls and fences, i.e., both sides. Furthermore, based on Criterium’s recent study, the amount of lineal feet of coverage of walls and fences is far greater than originally plotted. If true, that would mean that the amount of reserves needed to fund walls and fences is far greater than initially projected and will have a significant impact on needed reserves. More on the Ham Radio Club under attack. I had intended to report that the Management of the Amateur Radio Club was out to destroy the club. Follow-up investigations shines more light on this matter. On the top of Independence Center, one can obverse multiple antennas on the roof. This construction has occurred over the last few years. The SCA Board has procured amateur radios and supporting equipment expending tens of thousands of dollars of SCA funds. This equipment was intended for outfitting the Sun City Anthem Emergency Prep Service Group (EPSG). The EPSG has a room in back of Channel 99 in the Independent Center. This room is where the amateur radios are located. It is left for another article to answer the question what is the SCA BOD doing buying amateur radio equipment. The question for today is who are the FCC licensees using this SCA funded amateur radio equipment. To operate Amateur Radio equipment an FCC test must be passed and FCC license granted. Amateur Radio Licenses are public records. Are SCA’s volunteers properly licensed? 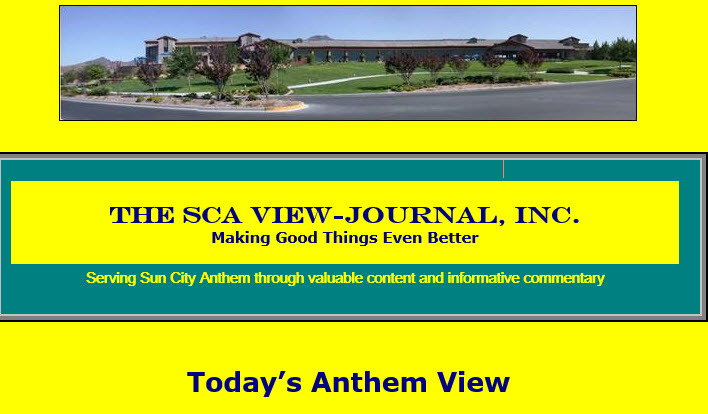 The SCA View-Journal, Inc. is an educational and news service designed to support the information interests of Sun City Anthem homeowners and is not affiliated with the Sun City Anthem Community Association, Inc., Del Webb Corp., or Pulte Homes, Inc. There is a lot of confusion about what is happening to the recall petitions (with 825 signatures) to remove four directors from the Board. In my opinion, the homeowners are purposely being kept in the dark. The General Manager (GM), Sandy Seddon, is using a lot of dirty tricks to stop owners from voting. The suppressing of accurate and timely information is just one way to make it less likely that you will vote. The removal election update at the Sept. 28th Board Meeting consisted of the reading of a letter from the HOA attorney that listed which petitions had enough signatures (715) to place a director on the removal ballot; Rex Weddle (758): Aletta Waterhouse (734); and Tom Nissen (726). However, the petition against Bob Burch fell two signatures short (713) of the 715 needed to place him on the recall ballot. It is important to note, that the oral report did not contain any attorney-client privileged information, but did include specific details about the procedure for the recall election that should be immediately available (in writing) to the homeowners in order for them to plan their vote. Makes no provision for those who will not be able to receive their mail during those dates. I believe that Seddon’s justification is simply another attempt to obscure information in the hope that the homeowners will not correctly vote or not vote at all. The acts of suppressing dissent and disenfranchising voters are intolerable practices that permeate this administration. It violates one of the most fundamental principles of good governance: FAIRNESS! I have forwarded my request to make this oral report available on the HOA website, along with Seddon’s refusal “justification,” to the Nevada Real Estate Division (NRED) Investigator assigned to my complaint. I have stated that the attorney, management, and Board President Rex Weddle are interfering with the removal election process and asked that the NRED look into this matter. Click here to see the notarized complaint regarding election interference. While the attorney, GM, and the Board are doing everything they can to obscure information from the homeowners, the “anti-recall” people are doing everything that they can to confuse the issue. Recently, the anti-recall people sent a letter to everybody’s home claim there are no complaints on record against the Board members that are up for recall. That is simply not true as I have personally filed four complaints which are being investigated by the Nevada Real Estate Division investigation unit, and Interference in this removal election process is one of the complaints. Taking over the removal election process and usurping all duties of the SCA Elections Committee in violation of their charter and the SCA Election & Voting Manual. Using the attorney in excess of the adopted budget ($73,000 over the approved budget in four months) to interfere with the owner’s rights to vote and to control who represents them on the Board. Making a secret contract with a CPA for at least $10,000 that was not in the approved budget and which has been concealed from owners, despite a legal right to see any contract of which SCA is a party. Refusing to step aside and allow the Election committee to do their job as usual with unpaid volunteers and, in this case, utilizing the expertise of the State of Nevada to ensure the integrity of the Removal Election process. Providing information and control to President Rex Weddle, who is subject to recall, and giving information access to David Berman, the self-proclaimed head of the Oppose Sun City Anthem Recall (OSCAR), anti-recall effort. Information was concealed from me, an elected Board member and liaison to the Election Committee, even though I was not facing a petition to be recalled. In summary, I would like for you to ask yourself a question. How is it ever good for homeowners to understand and properly participate in the community affairs if management prevents timely access to information such as voting rules controlling a removal election? I may be going out on a limb here, but I say it’s never good for homeowners if management conceals information that owners need and have a right to know. So, who does benefit when management makes a fair and open removal election nigh on impossible? Again, out on that shaky limb, I say it is beyond “not good for homeowners.” It is horrible for homeowners that this manager and this attorney, are working in concert with this Board to unlawfully interfere with the homeowners right to a fair election to remove President Rex Weddle, Secretary Aletta Waterhouse, and Director Tom Nissen, in accordance with the legal requirements afforded in the HOA By-Laws, but which they unlawfully suspended when they removed me from my Board position. Jim Coleman was appointed to fill my Board seat – I think the Board exceeded its legal authority by both, removing me from my Board position without a trial and proving legal cause, and appointing Jim Coleman to the Board without allowing others to compete for the position or the owners to vote. However, despite all that, Jim appears to be a man of integrity and principles and completely not complicit with the bad acts of the Board. I think that he deserves everyone’s support. Note: A Tale of Two Faces is a coming blog article about the face of Sandy Seddon that the Board knows and loves, and the face she turns toward the large segment of the community. The face that produced 836 signatures testifying to their polar-opposite experience. Our community has been divided into Have’s and Have Nots, and we need to examine why. No temporary use of the restaurant space for clubs or member use will be allowed. Despite the fact that there is no funding in current (or next year’s) budget, the Board is looking to hire a Restaurant Consultant, for an unknown cost, to tell us what we already know. The GM has sent out a Request For Proposal (RFP) to an unknown list of consultants. It is a violation of our CC&Rs 7.2b to keep the restaurant closed this long, and because the Board treats this issue as trivial, no attorney opinion has been sought. I believe that the Board is cherry picking which rules to follow and this violation is one of the complaints I submitted to the Ombudsman. The restaurant is a major amenity which can’t legally be left closed except for maintenance and repairs. What if the GM just drained the pool and left it empty for two years? Even if you never used the pool, wouldn’t you worry that an empty pool would hurt our property values? CAM Lori Martin’s resignation was announced a month after staff knew she was leaving. – It should be noted that I have consistently questioned (and been harassed and retaliated against for asking too many questions) the need for employing two high salary people with CAM licenses when only one license is required. I advocated that we employ a single CAM at the appropriate compensation level with a management agreement per NRS 116A.620. My complaint is now moot unless the Board decides to replace Martin. Stay tuned for a future blog that will discuss why it is important to examine the structure of the organization before replacing Lori Martin with another CAM doing the same job. Jim Coleman was appointed to the Board (to fill my Board seat that had been deemed vacant on August 24). Musical Chairs: Why stop the music now? The Board said they could declare a (my) seat vacant just because they said so. I say kicking me off the board without a trial or members voting me off is not legal. The Board says they don’t have to wait for judgment on the legality; they can just pick whoever as a replacement. Rana Goodman asked the Board to wait a couple of months until the legality of the (my) vacancy is confirmed, or there are other vacancies because of the removal election. Rex Weddle said the Board was way too busy to leave a (my) spot vacant. Rana asked what they plan on doing when they are ordered to reinstate (me) the Board Member. Rex said not their problem. In his self-introduction, Jim Coleman quoted parts of an email from an owner asking him not to agree to fill my seat until my appeal was done to avoid being embarrassed or tainted by illegitimacy. Jim rightly rejected the request to step aside but for the wrong reason. He thought it was a veiled threat. I don’t think it was. I took it more like the writer didn’t want the Board to get away with pretending they had to power to illegally dump a disagreeing director on the strength of their six votes. I don’t think the six voters on the Board should get away with usurping control of the seat from the owners who voted me in, and who next week may be voting some of them out, just by shifting the focus onto a non-existent fight between Jim Coleman and Nona Tobin over who gets to sit in the seat. A question of values: Who is Jim Coleman? Rex read a bio of Jim’s accomplishments, status as a top athlete, Founding President of the African American Heritage Club, and more. But Jim eloquently told the crowd that we needed to know his character: He will listen. He will not rush to judgment. He will be fair. He stated that at 75-years-old, born in Mississippi, nothing in this place scares him and he will not be intimidated. My stance was a disaster, and I was branded an uppity naysayer who didn’t know her place. On day one, the tone for my tenure was locked and loaded. However, that did not (or has not yet) happen to Jim Coleman. The six directors dumped me without a vote of the membership, and they filled my spot without any notice, any recruitment or competition or any vote to fill the seat. These things are wrong, unfair and illegal, but Jim Coleman still needed to take that spot to protect all of us. If he didn’t take my spot, the board would just have appointed someone else in secret, without competition, and probably somebody in Rex’s image who owners would like a whole lot less. Jim Coleman is a man who speaks of character, integrity, and principles. He deserves our support, and we must do whatever we can to ensure that he gets a different board seat should I be reinstated. My personal preference is for Jim to take Rex’s seat on November 1st, after more than 2,501 owners vote Rex out in the upcoming removal election October 9-26. Board Action: Received oral update of removal election to be held by mail only. No ballot boxes. No walk-ins. Ballots will be sent out on October 9th and must be returned by mail and received by October 26 5 PM in the pre-addressed envelope to the CPA’s Office. Art Lindberg read the update from (our very expensive) attorney about the removal election. However, no copies of the letter were distributed, and won’t be in the Board Book, thus continuing the pattern of making access to information as difficult as possible. Remember, over 800 people signed each of four petitions to call for a vote to remove from the SCA Board President Rex Weddle, Secretary Aletta Waterhouse, and Directors Tom Nissen, and Bob Burch. The Recall Petitions were received by management on 8/10/17 and were given to the CPA to verify the petition signatures. Again, it should be noted that Management, upon the advice of counsel, took away all the normal duties of the volunteer Election Committee to pay a CPA that was selected by the attorney, at a fee of least $10,000 to verify, distribute, collect and count ballots. Of the four petitions, three (Rex-758, Aletta-734, and Tom-726) had more than the needed 715 signatures to be subject to a removal vote. Bob skated as he received 713 signatures. What they didn’t mention was that there were over 65 signatures submitted after the petitions were submitted, and even though the state law says there is no deadline, those signatures will not be considered. The law makes removing a director much harder than the election to get on the board in the first place. The law (NRS 116.31036) says that the only way a Director can be removed from the Board is by a secret ballot in a removal election which is called by petition of at least 10% of the voters (715 of the 7,144 in the community) in which at least 35% of the possible voters (2,501 of 7,144 Lots in SCA) vote to remove each director and at least half of those voting in favor of removing that director. Clearly, the Board’s claim that six of them voting to remove me is equally powerful to the 2,501 votes from owners that it takes to legally remove one of them is ludicrous, and the attorney who authorized it should be fired. I have a complaint to the Ombudsman, which has been referred to the HOA Investigations division, about the GM, attorney and Board president Rex Weddle interfering in the removal election process. The Election Committee was taken out of the process, and the Election and Voting Manual is being violated willy-nilly. This shows a continuing pattern of making the removal process even more difficult and further diminishes the value of each owner’s vote. Specific instructions will be sent out with the ballot and must be followed exactly, or the vote will not count. All ballots must be received in the mail by 5 PM at the CPA’s office on October 26. No ballot boxes. No walk-ins. Just so that each homeowner is aware, the SCA By-laws specifically addresses the process by which a Recall Election must be organized. 3.6. Removal of Directors and Vacancies. (ii) At least a majority of all votes cast in that removal election. (v) The incumbent members of the Board of Directors, including, without limitation, the member who is subject to removal, may not possess, be given access to or participate in the opening or counting of the secret written ballots that are returned to the Association before those secret written ballots have been opened and counted at the meeting of the Association. Upon removal of a director, a successor shall be elected by the Owners entitled to elect the director so removed to fill the vacancy for the remainder of the term of such Director. Look for more information on my blog, coming soon, as to what you can do to help remove Rex Weddle, Aletta Waterhouse, and Tom Nissen in this election. For now, if you know you will be gone or your neighbor will be gone, let the front office know at (702) 614-5800 to get the ballot sent somewhere else. We want to make sure all owners get a ballot and get a chance to vote. Ballots will be mailed out Monday, October 9 and must be received back by mail by 5 PM, October 26.